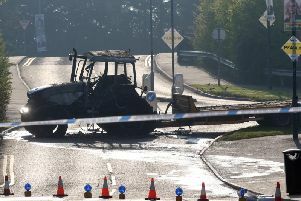 When he fell asleep at the wheel of a car a 39-year-old man crashed into an articulated lorry on the A1 dual carriageway, Banbridge Magistrates Court heard last Wednesday. Artur Ferster, Dunraven Park, Belfast, was fined £200 for driving without due care and attention on April 22 this year. He was also given six points and ordered to pay a £15 offender’s levy. The court heard police were called to a road traffic accident on the A1 near the turn off to Katesbridge. A car, facing the wrong way, was in the central reservation and an HGV lorry was on the hard shoulder. Ferster told police that he had fallen asleep while driving. No-one, however, was injured in the accident. A barrister representing the defendant he had no previous convictions and there were no points on his licence. He explained his client had been over at a funeral in Poland and that he and a colleague had been taking turns at driving. The lawyer added that at the very least Ferster knew there was a momentary lapse of concentration. He said the defendant needed his car to get to work and to get his partner to work. District Judge Eamonn King said there was research showing that people falling asleep at the wheel was much more common; the consequences of the accident could have been fatal, he said, not only for the defendant but also other road-users. Judge King said the court acknowledged the defendant’s honesty and that the defendant, his passenger and lorry driver ‘lived to tell the tale’.